Eric de Vries from the University of Groningen. Photo: Copyright Sylvia Germes. Topological insulators, a class of materials that has been investigated for just over a decade, have been heralded as a new 'wonder material'. But so far, topological insulators have not quite lived up to the expectations fueled by theoretical studies. Physicists at the University of Groningen in the Netherlands have now discovered why and report their analysis in a paper in Physical Review B.
Topological insulators are materials that are insulating in the bulk but allow charge to flow across their surface. These conducting states at the surface originate from ordering patterns in the electrons that are different from ordinary materials. This ordering is linked to the physical concept of 'topology', analogous to the concept in mathematics. This property gives rise to very robust states with some special properties. For one, the electron spin – a magnetic property of electrons that can have the values 'up' or 'down' – is locked to their movement. 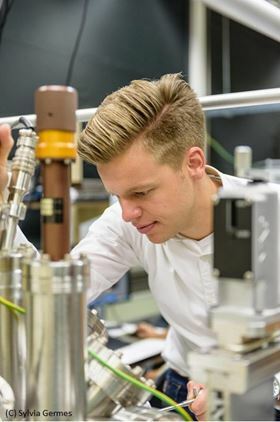 “This means that electrons moving to the right have spin down, and those moving to the left have spin up,” explains first author Eric de Vries, a PhD student in the 'Spintronics of Functional Materials' research group led by Tamalika Banerjee. “But it also means that when you inject electrons with spin up into such a topological insulator, they will travel to the left!” With this property, topological insulators might help to realize spintronics: electronics based on the quantized spin value rather than the charge of electrons. The special properties of topological insulators are predicted from theoretical analyses of their surface structures, made from crystals of heavy atoms. But experiments show mixed results, which don't quite live up to theoretical predictions. “We wondered why, so we devised experiments to investigate the behavior of the surface state electrons. Specifically, we wanted to see if transport is really limited to the surface, or if it is also present in the bulk of the material,” says de Vries. Earlier experiments by the group, in which they used ferromagnets to detect the spins of electrons in the topological insulator, were surprising. “We demonstrated that a voltage presumably originating from spin detection can originate in factors other than the locking of electron spin to its movement,” explains de Vries. “Using different geometries, we showed that artifacts related to stray magnetic fields generated by the ferromagnets can mimic similar spin voltages.” This observation may lead to a re-evaluation of some published results. De Vries went to the national High Field Magnet Laboratory at the Radboud University Nijmegen in the Netherlands, where a 33-Tesla magnet is available, one of the strongest magnets in the world. “Others have done similar tests with weaker magnets, but these are not sensitive enough to reveal the additional transport channels that coexist with the surface states,” he says. De Vries's experiments showed that a considerable part of the charge transport occurred in the bulk phase of the material, and not just at the surface. So why has no one noticed this before? De Vries stresses that interpreting transport measurements made on topological insulators can be difficult. “We experienced this in our previous experiments. Our message is that extreme care is needed in the interpretation of experimental observations for devices based on these materials.” Further experiments that might lead to clearer conclusions will require very high magnetic fields in specialized labs. For 10 years, topological insulators were all the rage and compared to the wonder material graphene. The discovery that, in practice, topological insulators have glitches serves as a reality check. “We need to study and understand the interaction between the surface states and the bulk material in much more detail,” de Vries concludes. Scientists have discovered why the two best methods for probing the electronic states of topological insulators produce different results. By combining tools from chemistry, mathematics, physics and materials science, researchers have found a way to identify novel topological insulators.